Where will our property markets be in 3 years? That’s a question people are asking now that our real estate markets have moved to the next stage of the property cycle – one of falling property values in some areas and slower growth in other locations. We are now seeing the predicted softening in both the Sydney and Melbourne markets after many years of growth. First time home buyers are surging back into these markets replacing some of the demand left by retreating investors. While there are a lot of property pessimist out there, one group of forecasts — those by BIS Oxford Economics suggests we are in for a soft landing. Their Residential Property Prospects 2018-2021 report, which predicts the Australian property market outlook, is well worth reading. BIS Oxford Economics is the only company I know which produces residential real estate forecasts over a three-year horizon and places them in the public domain in June each year. House price growth around Australia has been slowing in recent months, led by falling values in many locations in Sydney and Melbourne, Australia’s largest and most expensive property markets. That trend looks set to continue driven by tighter lending standards from Australia’s banking regulator – APRA at a time that our banks being allergic to risk following their belting in the Royal Banking Commission, along with weak wage growth, affordability constraints, an increase in apartment supply. These tighter lending conditions – the inability for many investors who could have in the past borrowed more – are really having the same effect as a rise in interest rates. In short… we’re in for a soft landing with further price falls in the short term and the stabilising real estate values. Taking inflation into account, modest price declines were forecast in most capital cities over the next 12 months. And then all capital cities will turn around and show price growth over the next 3 years, but the results will be fragmented. BIS suggests the current slowdown is due to tighter lending criteria, particularly a crackdown on interest-only loans, and record levels of dwelling construction being completed (above 200,000 per year), which may lead to an oversupply in some states. And the good news is that our housing markets won’t crash, being underpinned by record low interest rates, a “relatively stable, albeit subdued, economic environment” and strong population growth. But there should be some “upside” from 2021, as “high net overseas migration inflows [are] likely to be sustained in the coming years” — and “economic conditions begin to strengthen and supply falls back below underlying demand”. Population growth will absorb the huge supply of new dwellings from the recent construction boom, although any growth in rental will be minimal, according to BIS. 5) Our economy growing much the same as it has in the last few years. As you can see they predict strong economic fundamentals – nothing to suggest a property crash ahead. 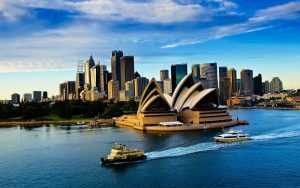 Sydney prices are expected to rise just 3 percent by 2021, the slowest out of every Australian capital city. The Harbour City has seen its prices soar by 85 percent since 2013, with investors — which account for over half the values of mortgages in that period — pushing up prices to record highs. In the face of retreating investor demand, the report forecasts that first-home buyer activity will support apartment prices. While the top end of the market is suffering from lack of buyers for prestige home and the lower end markets like Sydney’s South West or the Central Coast are being held back by affordability issues, some of the inner and middle ring suburbs are strongly outperforming the averages. BIS predicts Sydney’s median will fall by 2 percent in the next financial year (2018/19), but an undersupply of dwellings will prevent larger price falls. House prices in the Victorian capital surged 65 percent in the last five years, reaching a peak of $892,000 in December 2017. 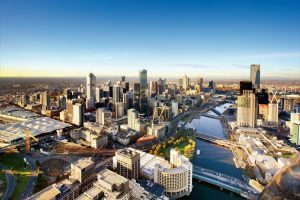 Even though the Melbourne property market it is taking a breather after 5 years of exceptional growth, there is no sign of a collapse in sight. Record population growth continues to fuel demand for housing, maintaining an overall undersupply in the market, the report stated. While the national population grew by 1.6% in the year ended 30 June 2017, the highest growth was in Victoria, with a 2.3% increase in population and experts have predicted it is likely to surpass Sydney as the largest city of Australia by as early as 2031. “While new dwelling completions are forecast to continue to rise through 2018, as the large pipeline of apartment buildings under construction work their way to completion, supply will be largely met by population growth,” the report’s author Mr Angie Zigomanis said. House prices are forecast to tread water through to 2021, rising below the pace of inflation. The report said the emerging downturn in new dwelling construction could spark a modest uptick in prices. Although the wider market is not expected to tip into oversupply, BIS Oxford Economics anticipates there will be pockets of apartment oversupply given the extent of new unit construction compared to houses. Unit prices are forecast to fall 2 per cent over the next three years. 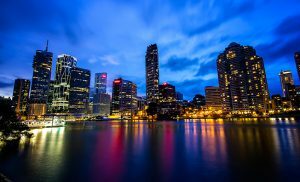 BIS’s forecast is that Brisbane will see the strongest growth over the next three years, jumping 13 per cent to a median of $620,000. An oversupply in the apartment sector is dragging down Brisbane’s wider housing market, but the sunshine state is starting to see a boost in interstate migrants — particularly from Sydney — with prospective buyers lured by Brisbane’s comparative affordability. “Some green shoots look like they are starting to emerge in the Brisbane market,” Mr Zigomanis said. Brisbane real estate has been buoyed by steady population growth driving demand and underpinned by good economic fundamentals including jobs creation and a low unemployment rate. Queensland has now become the number-one destination for internal migration, taking over from Victoria and overseas migrants are starting to see Brisbane as the place to be, bringing 12,847 residents into the city. Canberra’s housing market has proven to be somewhat of a quiet achiever in recent years, with momentum tipped to continue in the short term. House prices are forecast to increase 5 per cent over the next financial year before slowing over the following two years, culminating in an overall rise of 10 per cent by 2021. Apartments were tipped to record price growth of 6 per cent over the next three years. The report noted Canberra’s rental market was very tight, recording a 0.7 per cent vacancy rate in the March quarter. The Perth housing market has been in a slump for 4 years now. Perth house prices have declined by 13 per cent since 2014 but the worst could be over. “House prices in the Perth market appear to be bottoming out,” Mr Zigomanis said, pointing to stronger overseas migration and a reduction in the number of West Australians moving interstate. Perth’s vacancy rate remains high at 5.1 per cent and rents have collapsed, falling by up to 30 per since since 2013. Perth is expected to see “minimal growth” for the next couple of years, before it sees “stronger growth” in 2021. Hobart has been the strongest property market over the last few years, but remember — it is a very small market which can be easily moved in either direction. “However the current migration inflows largely comprise younger adults and families with children, suggesting people moving for Hobart’s affordability or expats coming back to raise a family,” he said. The median house is tipped to rise by 5 per cent over the next year, and then slow in following years. Both houses and unit prices are forecast to grow by 8 per cent by mid-2021. With South Australia’s automotive manufacturing industry shutting down, its economy and property market are currently subdued. A soft economic environment and lacklustre population growth will result in modest house price growth over the coming years, according to BIS. House prices are expected to grow by 9 per cent by 2021.
but the report’s authors said they expected them to have bottomed out. A general oversupply means prices are forecast to remain flat over the upcoming financial year, followed by two years of limited growth. House prices and unit prices are expected to life by 5 percent and 4 percent respectively.